Live the most exciting and fun experience of your life in the hottest month of the year. 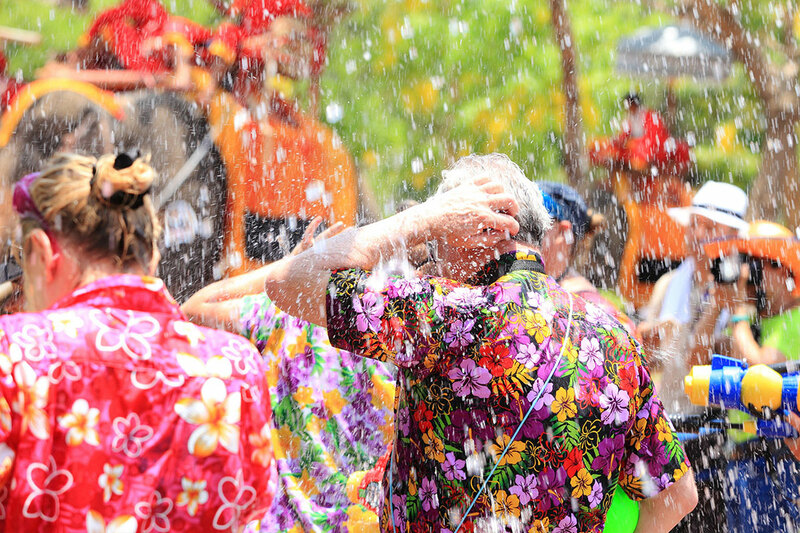 April is a very special month, because from 13th to 15th you can take part in the best festival you will ever attend, the Songkran! It is a fun, important and special festival that takes place during the Thai New Year. Did you think that only the Chinese had something like this? Well, think again, because during this festival, you are going to live so many exciting things… so many! Officially, it only lasts three days (April 13-15) but the celebrations extend to a week, where you can participate the most exotic, fun and vibrant water fight of your life! 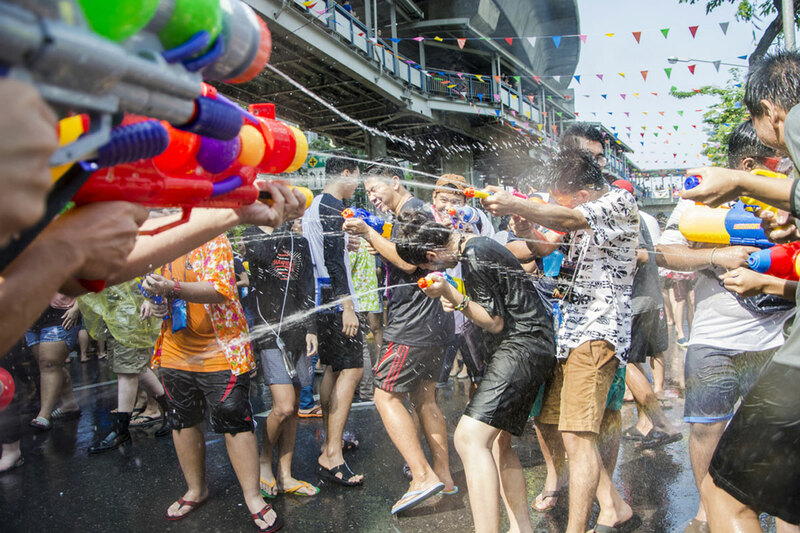 However, Thais are not engaging in this water fight just for the fun, because this vital element has a symbolism: the splashes will wash off you of all the misfortunes and bad energy that you carried during the last year, so you can start the New Year fresh and clean. Music, dancing, drinking and fun will flood into your life like water flooding through the streets of almost all the provinces in Thailand. For a complete week, the Kingdom will become an open battlefield where you will get wet for sure, but you will also have the chance to attack! Traditionally, it is the opportunity for family to reunite, visit the most important temples and take care of the annual house cleaning, which has a deep significance during the Thai New Year. The Rod Nam Dum Hua ritual is performed during the first day, which is officially regarded as the National Elderly Day, a moment to appreciate and recognize their wisdom and importance in Thai society. Elders are very important in Thailand, and the government and society have policies related to their protection and wellbeing. This ritual is beautiful to watch, because you will see how appreciation and gratitude is conceived in the act of young people pouring fragrant water into the elders’ palms, as a way of asking for their blessings that are product from experience and wisdom obtained over time. In the second day of this festival, we have the National Family Day, which is destined to celebrate the most important structure in society without which it wouldn’t exist. Family is central to Thais, and even though their values tend to differ from Western ones, it is the main foundation for their society. Families start their day by giving alms to the monks, and then they spend it with their loved ones sharing moments together, in order to celebrate this important day that reminds us how important family really is. Another of the beautiful and special rituals you will see during the Songkran is “Bathing the Buddha Image”. It consists in pouring fragrant water over Buddha statues at the temple and at home. It is during this moment that you will appreciate the rich, profound and picturesque Thai culture. 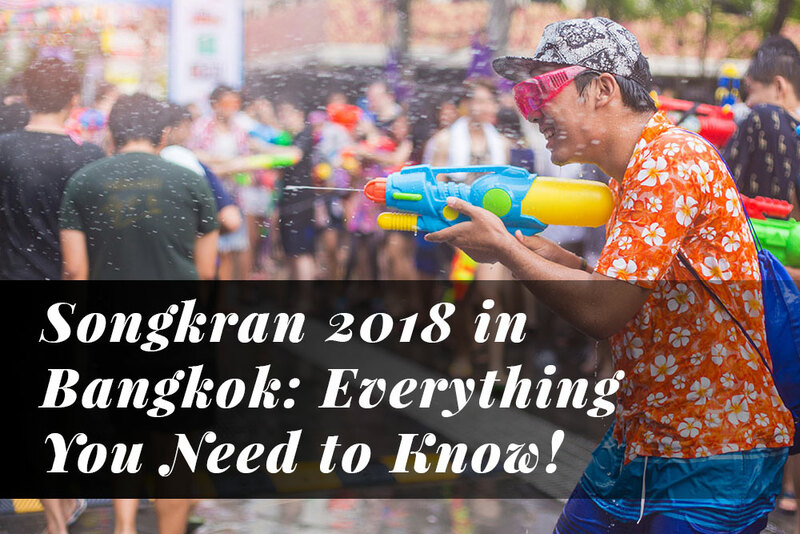 However, the Songkran festival is much better in Bangkok, and you are going to learn why. Even though Chiang Mai and Phuket are other popular destinations, you will find that BKK is better because it is much bigger with a population that surpass the 8 million mark! You will have many people engaging in this fight, so you have to be ready for a vibrant, active and very fun water battle. Local or tourist, rich or poor, boy or girl, children or adults, there are not exceptions! Everyone who wants to join this exciting celebration can do it. This is one of the most beautiful aspects of Songkran, because everyone can participate and live this amazing festival with a deep symbolism behind it topped with lots of fun! Even though there are not exact stats, you will find MANY expats in Bangkok from all nationalities, and thereby you will see a great mixture of different people engaging in the festival. If you are new here, then it is a perfect opportunity to meet up with other expats who may even be nationals with you! Locals and tourists have lots of fun, because this is the core of the celebration: to clean the misfortunes and start with the New Year fresh and with a smile. 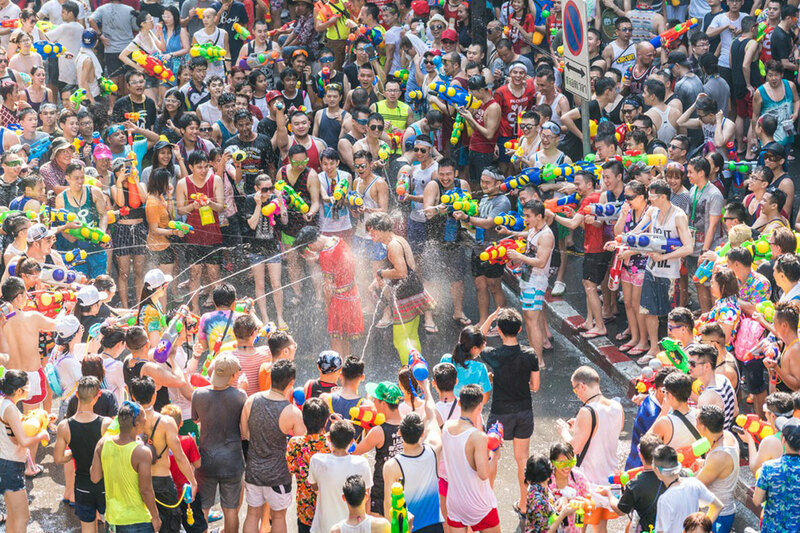 Therefore, this is another reason why we recommend celebrating this water fight in Bangkok, because you will have a lot more participants – and therefore a lot more fun – and because the pool of “water warriors” is very diverse, and thereby you will feel identified. How to Get Ready for the Action? You do not need to spend a fortune on equipment, because you will barely need between 100-200 Baht to get yourself up and ready for this amazing battle! The toys departments at Siam Paragon and Central Chidlom. Go there and you will find the best water guns that will bring you an edge during the celebration! As you can see, this is another reason to join this fight in Bangkok, because you even have many spots at your disposal where you can do your shopping. However, we move onto the next section, remember not to spray drivers, don’t even think about it! Don’t worry, because you will have so many people to target. Please, take this seriously, because targeting drivers can cause accidents. Now that you know the rules, you can participate without problems! How to Dress to Join the Fun of Songkran? You have the guns and now you need the clothes, no problem! If you want to personify this celebration and follow the same trend as locals, then wear flower shirts. They are HUGE during this festival, so you should definitively wear them. MBK Center. Another amazing shopping spot where you will find fashionable clothes to wear during the festival, and yes, for a low cost! Find it at Phayathai Rd, Pathum Wan, Khet Pathum Wan, Krung Thep Maha Nakhon 10330. You can also wear tank tops, and of course, shorts are accepted, so you can complete your battle suit! Get appropriate footwear, and “fortunately”, you can wear crocs. As everything will be wet, make sure that your shoes are optimal for these conditions, because you can fall off. Now that you know how to dress for the battle, it is time to move on onto the next questions! How to Prepare for the Festival? First, as it is so popular, because some tourists come exclusively for it or as the start event for their Thai adventure, you need to prepare in advance. You know the rest: what to wear and where to buy your clothing, where to buy your tools for the adventure and that’s all. How Long Do The Water Fight Last? Traditionally, they last from 7 am to 7 pm. Therefore, you must respect this, especially with locals. However, with expats and tourists (especially Western) – and also many locals –, they will be more than happy to continue after 7 pm. However, if someone asks you not to spray them, then respect it. It is fun and police do their job – furthermore, Thai people themselves are very friendly and respectful – but if you want to avoid trouble, then don’t bring too many valuables. As everything gets very busy and crowded, it is easier for robbers to steal from you. However, how are they going to steal something if you keep everything as basic as possible? Enjoy this festival keeping everything simple and straight to the point, so avoid bringing valuables or keep them to an extreme minimum. What’s Nightlife Like during the Songkran? People do go to clubs – and it is the perfect complement after having a lot of fun during the day – but the attendance decreases significantly, because don’t want to get wet with their club clothes. If you want to go to clubs where Westerners make up the majority of the crowd, then go to Levels or Glow. However, the chances of getting wet will increase! Therefore, if you wish to party after battling all day, attend with fresh clothes that you won’t bother getting wet. If you prefer to keep everything light afterwards, then feel free to visit us at Apoteka, so you can enjoy live music, delicious food and refreshing cocktails and drinks! After all, this is the spirit of the festival, so just take it easy, party and enjoy! You are pretty much ready to celebrate and you already know why this festival simply rocks in BKK! Keep it easy on drinking, because as the festival lasts for three days, you won’t want alcohol to interfere with the real fun of this celebration! Keep yourself hydrated, and no, do not drink the water used during the fights! Take these simple recommendations in mind and you will be fine! Now you are ready to enjoy this fantastic festival! Believe us, this is one of the most exciting experiences you will ever live in your life, because it is different and has a deep meaning behind it. It is the perfect mixture between tradition and fun, which together create one of the most interesting attractions in Southeast Asia. And the final recommendation: have fun! Get along with people, try different things and just have fun, because you are going to love it from beginning to end!